Welcome to a brand new feature! 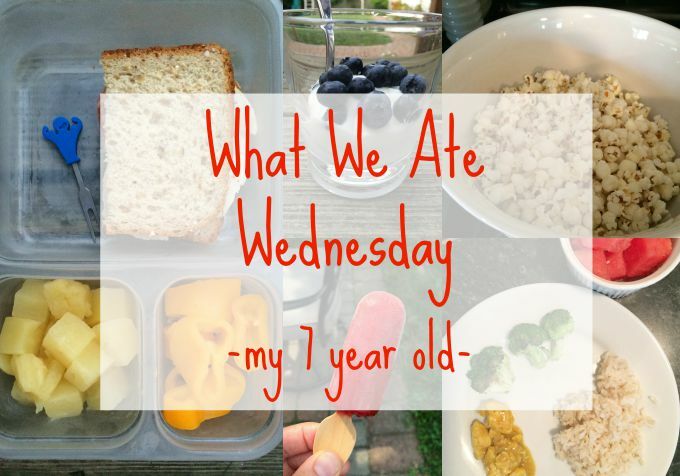 A lot of bloggers do “What I Ate Wednesday”. It’s technically what they ate Tuesday (but posted on Wednesday) and details everything they had for the day. 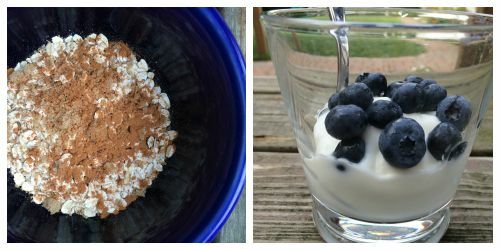 I decided to do my own spin on it and show you what we ALL eat–including my husband! 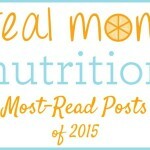 And in typical Real Mom Nutrition style, I’m going to be honest: I’ll show you the good, the not-so-good, and everything in between. 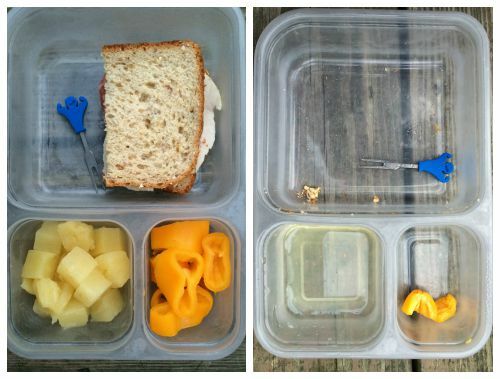 When it comes to my kids, I’ll also try to show some before-and-after shots for meals. Because even beautiful lunches can come home unfinished, dinners may get rejected, and on unseasonably warm schooldays like yesterday, my kids may end up having two popsicles. That’s reality! He had a bowl of oatmeal made with old-fashioned oats, a sprinkle of brown sugar, a hefty shake of cinnamon, and milk. (I microwave this for about a minute. It’s chewy, but we like our oatmeal that way around here!) Then he had a vanilla yogurt/plain yogurt mix with fresh blueberries. He ate all of both. I packed him half sandwich made with Applegate roasted chicken breast and salami on whole-grain bread; mini raw sweet peppers; and pineapple chunks. He ate it all (except one bite of pepper) and complained when I picked him up from school that I didn’t pack enough food. Noted! He was really hungry and hot from our walk home from school in the 88-degree heat. 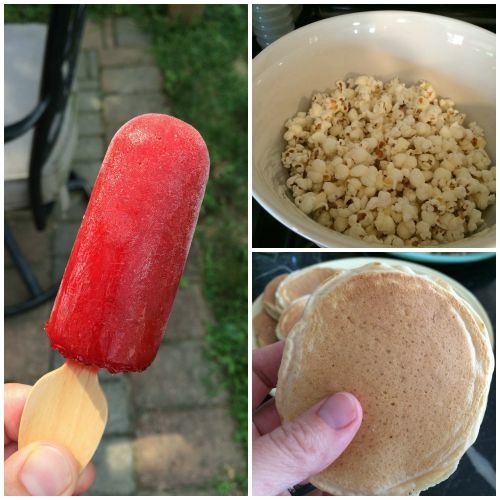 So he had a small homemade ice-pop (I made them by combining fresh strawberries and a splash of orange juice in the blender), stove-popped popcorn (get the recipe for No-Fail Stovetop Popcorn), and he swiped a plain whole wheat pancake from some recipe testing I was doing. We had chicken curry, which he does not like. So while everyone else got curry on top of rice, I kept them separate for him. (I know serving family-style is a great strategy and maybe my kids are just lazy, but they prefer that I plate their food for them!) I put some curry on his plate in case he was feeling adventurous and wanted to eat some (he didn’t). He also got a portion of the brown rice, stir-fried broccoli, and watermelon we were having, plus a glass of milk. (He requested soy sauce on his rice, which he got.) He asked for and ate seconds of both the rice and broccoli. Then he chose to have another ice-pop as his sweet treat, this time a store-bought Outshine bar (I like those because they’re made with fruit juice and no artificial colors). After another walk to and from school for curriculum night plus running around on the playground, he was wiped out and hungry. 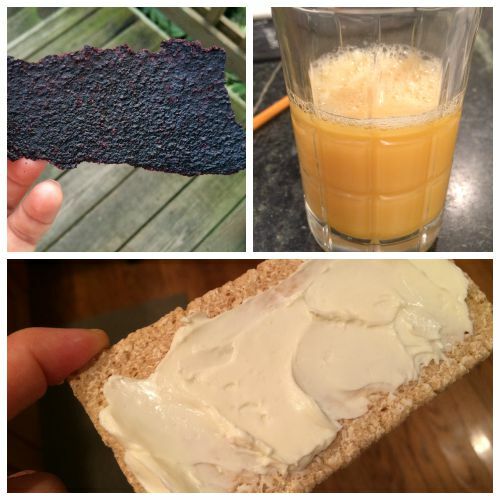 He had a couple all-fruit dried blueberry strips I got in a goodie bag, a Wasa cracker spread with Laughing Cow cheese, and a small glass of calcium-fortified orange juice (that’s one of those tiny juice glasses–perfect for small portions). Disclosure: I am a member of the Applegate Sandwich Board advisory group and am compensated for my time. As always, all opinions are my own. I love posts like this! What a luck kid to get such yummy food! THANK YOU! 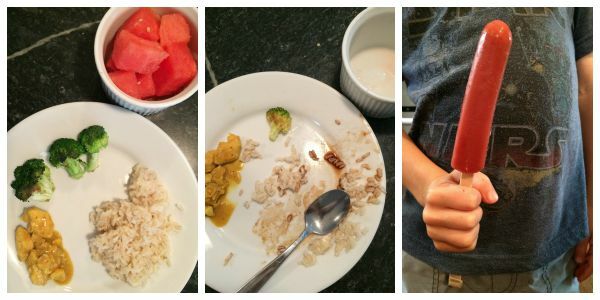 I have a 7 year old too and it is helpful to see how much other kids his age are eating. Jamie–glad you liked it! Each kid is different of course–and at least with my kids, each DAY can be different!–but I thought this glimpse might be fun. How ’bout tallying up the macro nutrients for us and compare alongside recommended daily? If it’s not getting too personal, that is. I usually keep a rough tally in the back of my mind for our family meals and try to hit some kind of average by not running too many “over” days or “under” days together in a row. BTW, I started doing this out of fear of too much fat around here and discovered we tend to run toward a lot of “under” days on protein unless I pay close attention. Thanks for your suggestion and I can understand why that might be interesting. I actually try not to fixate on numbers too much–and getting a truly accurate nutritional analysis would mean measuring out all the portions, which would be impractical and too disruptive. I try to think about proportion and balance: Did we eat enough veggies today? Have we gotten too much sugar already? etc. Those are the questions that guide me through the day. Sounds like that’s similar to what you’re doing as well. I know it is a pain to even think about calculating nutrients especially since we all have been trained to be very, very precise. I will never forget how I dreaded those exercises at college. But maybe some ballpark calculations once in a while by just guesstimating portion sizes? I mean, just blowing it off and using one or two food types as a proxy isn’t very professional either. Not criticizing here because I do it too but just assuring we are “eating enough veggies today” doesn’t cut it. Veggies are great and everything and they sure are all the rage but by themselves they certainly are not the gold standard for a fully balanced diet. I just think we put way too much confidence in this food or that food, maybe because USDA has always dumbed down nutrition standards by suggesting if you eat from all the food groups you’ll be OK. But then each of us picks out our favorite food group (veggies for you, dairy for me, my hubby has declared bacon to be a food group) and we call that “good enough”. Sort of like checking the oil in the car – probably ought to take a minute and do it every once in a while. My point in doing this is to give people a look into the kinds of meals and snacks we eat. I’m not going to weigh and measure my seven year old’s portion of dinner before and after the meal. I can see the benefits of tallying up approximate serving sizes of the food groups at the end of the day and comparing to the recommendations–and it’s something I will definitely consider. This is the first type of post like this that I’ve done, so the format and content are works in progress. But while I certainly appreciate your ideas, I definitely don’t appreciate being called unprofessional. This is fun. I have a 7 year old as well. 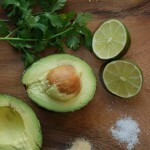 I love seeing what others eat! Thanks Dana! I enjoy reading other people’s WIAW posts, and thought this would be a fun twist on it. This is an awesome post, Sally! 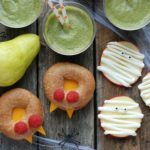 I love seeing what others eat, and it’s especially fun to see what kiddos like to eat. I imagine my 7-year-old self wouldn’t like curry either, but now I’m obsessed 🙂 His taste buds shall grow! I thought the same thing at that age. My mom use to make ‘mild’ chili and put chili powder on the table so my dad could spice his up. I would shake tons of it on my chili just to show how grown up and like my dad I was. I do the same thing with dinner. 3 out of my 4 boys can get funny about anything and everything at dinner. I serve the foods separated and tell them they at least have to look at it on their plate. I make sure to have plenty of veggies because they don’t grumble about them. This is so interesting! Thanks for giving us this glimpse into your life. What brand is the container you put his lunch in? Ziploc? Thank you! Hey Katy–Yes, that is a Ziploc container. I have a couple left (they are discontinued) and I use them when I want to pack something that could spill (in this case, canned pineapple chunks). The EasyLunchboxes are our go-to containers but they are not leak-proof. So much fun to see what your son is eating! Can’t wait to see the coming weeks of this new feature!